¢ Full color drawings and color-coding of important text and music motivate and inform. ¢ Three starting systems help ensure positive results in any beginning situation. ¢ FOR ... ONLY exercises (i.e. FOR FLUTES ONLY) offer idiomatic solutions to the unique challenges of each instrument. ¢ Excellerators (advanced supplemental exercises) reinforce and enrich performance basics. ¢ A nine page FOR OBOES ONLY starting system gives beginners a solid foundation for learning in the full band setting. 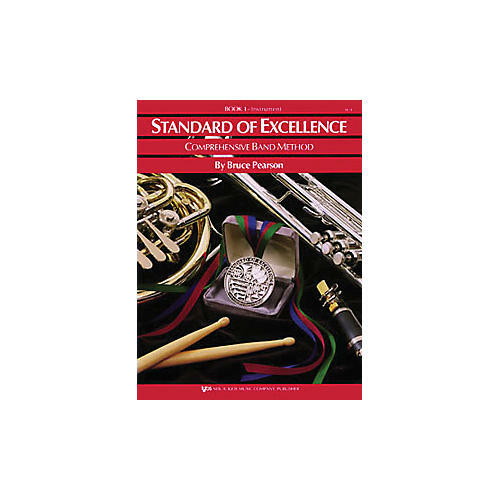 ¢ Expanded French Horn and Percussion books, including a separate book for Timpani & Auxiliary Percussion, address the unique needs of beginners on these instruments. ¢ A comprehensive, totally-correlated Electric Bass book offers expanded opportunities for student involvement. ¢ Music from over 20 countries, with correlated enrichments, encourages multicultural study. ¢ A built-in reward system motivates students and encourages musical growth. ¢ 600-plus page full Conductor Scores contain Objectives for every line of music, Director tips, extended reference articles, duplicable worksheets and quizzes, and theory, listening, composing, improvisation, geography, foreign language, history, and other interdisciplinary Activities for Excellence.